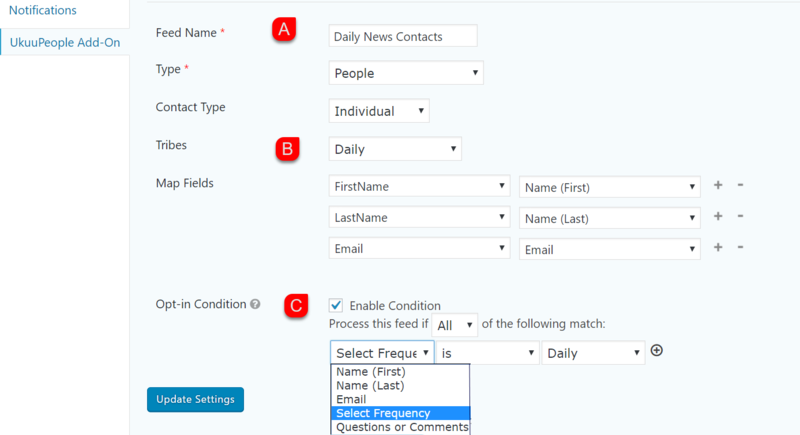 Perhaps your form has some options you want contacts to select from. In our Newsletter Opt-In form, we asked people to choose whether they wanted our Daily, Weekly, or Monthly newsflash. Ideally, I'll set up a feed for each option, so that the responses are automatically categorized into Tribes that I can sync with my MailChimp lists. Here's how I'll use the Opt-in Condition to facilitate that. First, we'll go to the correct form, navigate to the UkuuPeople Addon settings, and Add New feed. Now we're ready to set up the first of 3 feeds. This one will be the Daily feed. A. Create a Feed Name. B. I want these contacts to be categorized as part of the Daily Tribe. C. After mapping which fields to save to this contact's record, I want to set a condition. So select " Enable Condition." In this case I only have one condition: the Frequency selection must match "Daily," or I don't want this feed to be activated. If I had more than one condition, I might choose to say that it must match either one ( Any), or it must match both (All) before the feed is activated. Once I save this feed, I'll go back and create a similar feed for Weekly, and then a third feed for Monthly. Depending on the type of newsletter blast chosen, one of these 3 feeds will be triggered each time someone submits their request, and all submissions will create a contact record with the appropriate Tribe selected.